The taste of the chicken avocado mixture baked was fantastic! Two problems I encountered: 1. This might fit into 8 avocado halves, but it is not 8 servings! My family of 5 was still hungry after finishing this off! This recipe might feed 3 people well. 2. 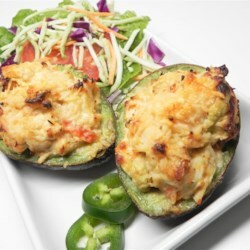 The avocado shells had an odd smell after being baked in the oven. This recipe might have been better with the chicken avocado mixture baked in a baking dish instead.